Pheidippides, the courier who saved Western Civilization. On one of my pediatric training rotations, I became aware that the two biggest readers on the ward, and the two brightest kids – by far – were both cystic fibrosis patients. CF is a horrible disease, affecting lungs, digestion, and other organs, and some children have the same barrel chests as old men with emphysema. Although medicine has made much headway in treating the disease, severe cases do not live past early adulthood, and all patients live their lives one lung infection or abdominal crisis away from death. Because the CF kids are chronically ill, they are frequently bedridden, and often in the hospital for lengthy stays. So I got to know these two kids a little better than most of the others. Despite their exceptional intelligence, they were remarkable in another way: no one in either of their families were educated beyond high school, and none of their relatives showed any interest in reading or other intellectual activities. Or at least their biological families did not; one of them, despite severe CF symptoms and some unrelated anatomical deformities, was so engaging and intelligent that a wealthy banker had adopted him. Two is not a very good number for drawing conclusions, but I started thinking about kids I had known growing up who were chronically ill, and how many of them went far beyond the education of the rest of their families. So I started asking bright people I knew if they had spent a lot of time alone as children. Almost uniformly they did, if not because of illness, because of growing up in rural areas without siblings of a close age. Occasionally they had stayed alone because of unsafe environments, either in the neighborhood, or sadly, even inside their own homes. But the pattern held up very well. And then one day I met an extremely bright young woman and asked her. She explained that she didn’t like to be alone at all, and had always stayed around other kids growing up. Now, she did read a lot, but she didn’t initially think of that as time alone. But if she was wasn’t reading, she was interacting with other people. I started watching her with interest and I began to notice that, although she had a very quick mind and a tenacious memory, she never said anything new. And in fact, she was quite parochial in her approach to new ideas. Once it was in a lecture or a book, she learned it immediately, but I never heard her question the book or the professor. And if a new, untested idea was being batted around among her classmates, she either didn’t participate, or occasionally used her quick mind like a machine gun firing down clay skeets. Since then I have run into a few others like her. One was one of the most amazing childhood intellects I have ever seen, amazingly creative and analytical from any number of directions. Professionally, however, he has fallen short of his childhood promise. And you certainly don’t want to debate him or even run new ideas past him. He’ll slice you up faster than a Cuisinart. But he never generates any deep, sustained ideas. And even more disappointingly, he does not seem to be interested in discussing or exploring ideas that he does not already agree with. It seems that he needs his ideas to come from some authority. I have come to suspect that thinkers fall into two general categories, sprinters and couriers. The sprinters are people who have very quick minds, but don’t necessarily go very far with ideas. I needed a name for someone who ran a bit slower, for protracted periods, and who went further. Today a courier is someone who personally delivers messages, but originally it was someone who ran on foot; the Latin root is currere, from which we also get words like current, currency, corridor and of particular importance here, discourse and concur.1)Other related words: courante, course, cursive, concourse, excursion, hussar (from Old Serbian husar, gusar, from Italian corsaro, corsair), occur, precursor, recourse, recur, succor; car, career, cargo, caricature, carry, charge, chariot, corsair; and even carpenter, which comes from the Latin carpentum, a two-wheeled carriage. The idea is not only that couriers run further but a bit slower, but also that they carry new information to us. Now, to tell the truth, I tend to think of myself and some other people I have met as hikers. I’m not all that quick in a verbal debate, which is why I prefer to write. If I can think ideas through slowly, pro and con, and live with them awhile, I can sometimes come up with something different to say (this blog is the result of a lifetime of hiking, and many of my friends reading this have been so kind, on so many occasions, to invite me to do exactly that). With that, walking and hiking are great occasions for sorting through ideas and getting some clarity. I mentioned that my family doesn’t have a TV, and gave some reasons for it. One that I did not mention is that I firmly believe we cannot develop our imagination and powers of analysis when there is a machine doing our imagining and analyzing for us. Friends often point out that there are great instructional programs on TV, which is true; but even there, the analysis is at a rapid pace, and so there is not the important time to put down a book and think about what we are reading. Another reason is that we cannot figure our who we are – which is what we believe — except when we are alone. When all we hear is the chatter of what everyone around us wants and thinks, it is hard to find the quiet space to ask ourselves if we agree; and when we are young and impressionable, we are unlikely to be aware that such questions are important. So time alone is the opportunity to think, and to learn to think. 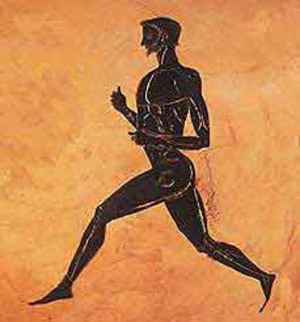 Picture of Pheidippides courtesy of MrCaseyHistory.com. 1. ↑ Other related words: courante, course, cursive, concourse, excursion, hussar (from Old Serbian husar, gusar, from Italian corsaro, corsair), occur, precursor, recourse, recur, succor; car, career, cargo, caricature, carry, charge, chariot, corsair; and even carpenter, which comes from the Latin carpentum, a two-wheeled carriage. My company strongly recommended that all employees take a speed reading class. Being an obedient corporate drone, I did so. I excelled in the class. Once the class was over, I never used the techniques again. Why? I much prefer to read and think. Sometimes, I read a bunch of pages before pausing to ponder something. But, at other times, I read a single line and think about it for quite some time. Blazing through a book at the speed reading rate gives absolutely no time to think. 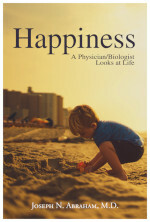 The only goal is to get to the end of the book and retain some of the important points. That’s not “reading” to me. Reading and thinking are one integrated process to me. Really good point. Of course, it’s not one or the other, it’s What’s the goal? Sometimes we just need to cover some info, think about it later. In that case, I wish I could speed read. But I’m with you, most of the time I need to stop and think. BTW, never, ever, try to read de Toqueville’s Democracy in America. It’s the most maddening book I’ve ever attempted, he throws out so many amazing insights, so fast, that every other sentence I had to put the dang thing down and go do some sort of mindless work so that I could think about it.